Edgar Allan Poe has firmly established himself as one of the most studied 19th-century American writers, a pioneer in the theory of the short story, and a hauntingly lyrical poet whose works continue to capture the imagination of modern readers. Because of his preeminence in the world of letters, Poe has generated a tremendous amount of scholarship, and critics continue to engage in disputes over his varied writings. Through chapters written by expert contributors, this reference synthesizes the vast body of material about Poe's works and addresses topics of central importance to Poe studies. Best known as the author of poems such as The Raven and short stories such as The Fall of the House of Usher, Edgar Allan Poe is now firmly established as one of the most significant 19th-century American writers. Since 1845, when his work was recognized in France by Baudelaire, his critical reception has endured a history of fluctuation and controversy. During the last 50 years, research on Poe has grown so much that it now rivals or possibly exceeds the renaissance of interest in Emerson, Melville, and Henry James. His work has been adapted for popular consumption through several films; and early editions of his works, printed in small quantities, continue to command high prices. This reference companion, the third in a series with others on Melville and Henry James, is a guide to the tremendous amount of scholarship Poe has generated. Through chapters written by expert contributors, this volume reviews and represents Poe biography, criticism, aesthetics, philosophy, and influence. The first section of the book includes chapters on Poe's life and discusses the problems confronting Poe's biographers. The second section primarily offers textual criticism of his individual works, while the third and fourth sections treat broad topics related to his philosophical views and aesthetic theory. The fifth section consists of chapters on the legacy of Poe as a world author and his lasting influence on literature, popular culture, and fine arts. 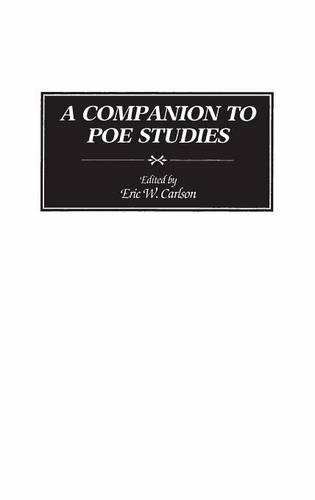 Chapters include extensive documentation, and a bibliography at the end of the volume lists the most significant resources for the study of Poe. About: Edgar Allan Poe has firmly established himself as one of the most studied 19th-century American writers, a pioneer in the theory of the short story, and a hauntingly lyrical poet whose works continue to capture the imagination of modern readers.